Each of us in the Communication team works 2 shifts a day in the tower. Today for example I worked the morning shift with Pete and the afternoon shift with Crispin then Callum and Crispin took over for the evening shift and Pete had “second night gash” in the evening. A typical shift in the tower will involve flight following and base radio communications. The computer on the left is used for AFTN flight planning. This is where we submit the AFTN flight plan intentions and update departure and arrival times for each flight. Next week we will be changing to the AFPEX web-based flight planning application https://ts1.flightplanningonline.co.uk/ instead of the UDP based installed Copperchase AFTN client software. This will make the client PC easier to administer and eliminate the need for a dedicated established network link through to Swanick NATS centre. Also on the left side of the desk are our antenna choosers and rotator. We have 4 HF antennas. A North-South, an East-West, a Rotatable log periodic and an emergency HF. The emergency antenna is connected directly to our batter powered iCOM ic- 78 which we only use during power downs. The other 3 antenna we can switch between our 3 HF transmitters. The main console of the desk has our 2 skanti HF sets and the marine and aero VHF units. On the right corner of the desk we have our Iridium and Cisco VOIP phones. 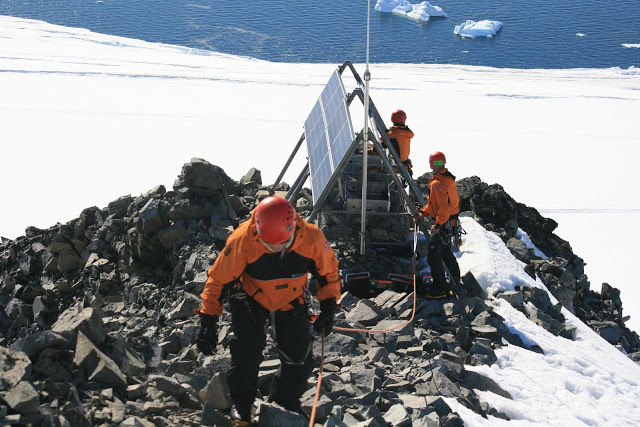 It has been mentioned in my training that local Rothera base operations use hand-held marine radios on Channel 1. And Channel 18 is used as a secondary operational channel for coordinating cargo work and fuelling operations. Sounds simple I thought. Until it was further explained that there is a VHF Channel 1 repeater on the ridge above the base and a Channel 18 repeater mounted on the tower. Perhaps I shouldn’t admit my ignorance here in public, but initially I was puzzled as to which frequencies the repeater would be listening for and transmitting on to repeat a these marine VHF channels. I found the answer by learning more about the difference between simplex and duplex VHF marine channels. 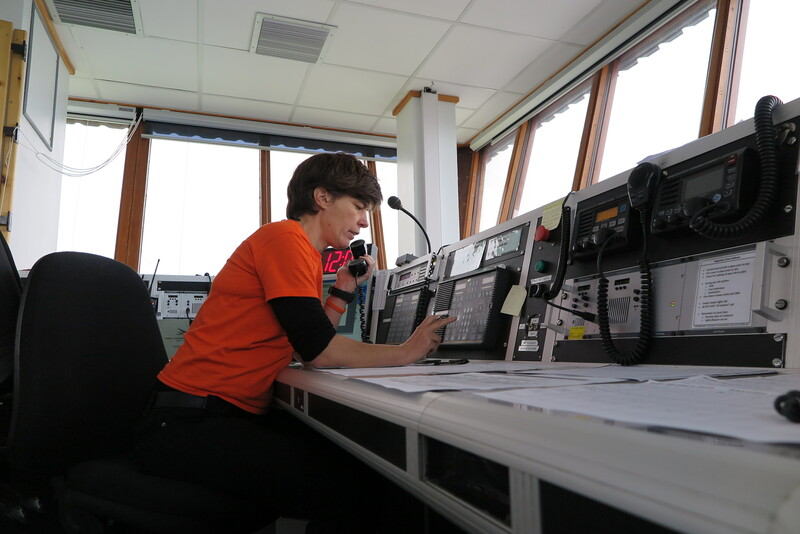 The VHF frequencies between 156.0 and 162.025 MHz have been assigned to marine radio communications. But you rarely hear anyone refer to specific frequencies it is always described in terms of channels. For example 156.8 MHz is the international calling and distress channel but it is always referred to as Channel 16. Now say myself and a friend are dropped at a very remote field camp and we both have marine handheld radios with us. Now I (wrongly) assumed that we could use these walkie-talkie style for line-of-sight communications around the camp area on a channel of our choosing. But what puzzled me is how a repeater could possibly be fitted into this scenario. If the VHF radios are talking directly to each other you wouldn’t also want a repeater duplicating the message on the same frequency. That would be mayhem. In fact direct walkie-talkie style communications only works on marine radios for simplex channels (eg 6,8,9,10,11,12,13,14,15,16, 17…). Channel 01 only listens to repeaters. Duplex channels were designed to solve the repeater problem. 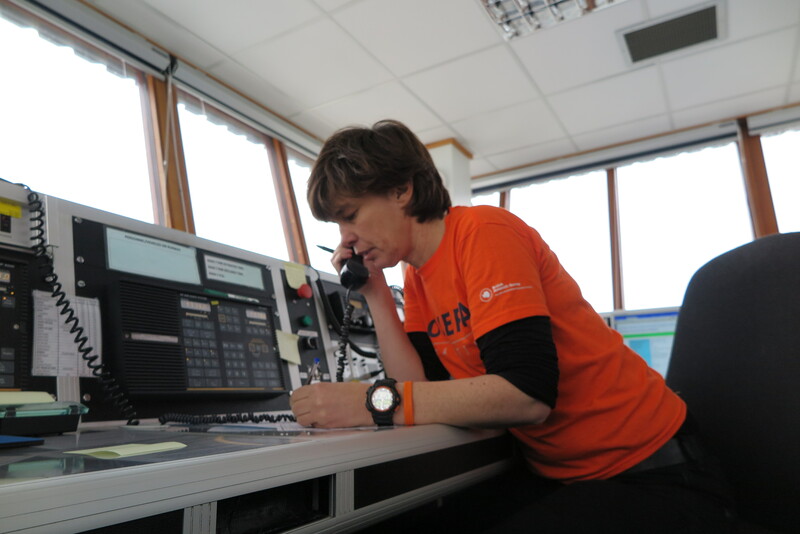 The VHF duplex channels (eg 1,2,3,4,5,7,18,19,20…) only work when a shore based repeater is in range. You cannot talk directly station to station on a duplex VHF channel. If someone is standing right next to you and you transmit a message on channel 1 the person next to you will not receive the message because channel 1 is a duplex channel. This means that channel 1 on their radio is not listening to the same frequency that channel 1 on your radio transmitted on. However if you both change to channel 6 which is a simplex channel your radios will indeed now happily talk directly to each other on 156.3 MHz. So what’s the difference between simplex and duplex ? Simplex is simple there is only one frequency assigned to the channel and marine radios transmit and receive on that frequency. For a duplex channel two frequencies have been assigned to the channel and marine radios have been built to receive on a different frequency to the transmission frequency. On channel 1 marine radios will be listening (RX) on 160.65 MHz but sending(TX) on 156.05 MHz. This means that two radios both tuned to channel 1 cannot listen directly to each others transmission. On channel 1 the radio is only listening for messages from the repeater. 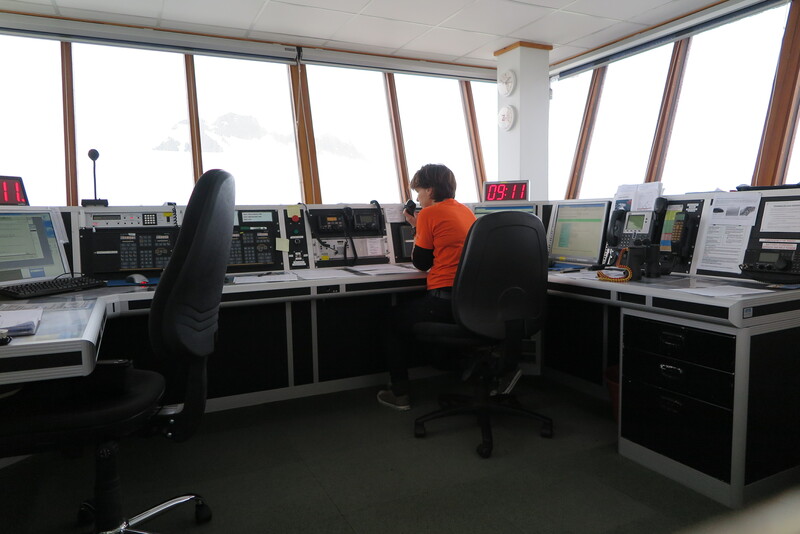 A channel 1 repeater like the one on the ridge at Rothera listens (TX) on 156.05 MHz and re-transmit(TX) this on 160.65 MHz. The radios around the base station only listen to the transmissions from the repeaters on 160.65 and ignore all the 156.05 transmission from the handsets. This matters for a couple of reasons. Firstly if the repeater were to fail all base communications on channel 1 would instantly stop working. Folk around the base couldn’t talk directly to each other. But they could simply change to say channel 6 or 17 which are simplex channels and talk station to station. Also if a field party wanted to use marine handsets for camp communications out of range of the repeater they would need to choose a simplex channel. In summary choose a simplex channel for direct station-to-station communications and choose a duplex channel only for station-to-repeater-to-station communications. 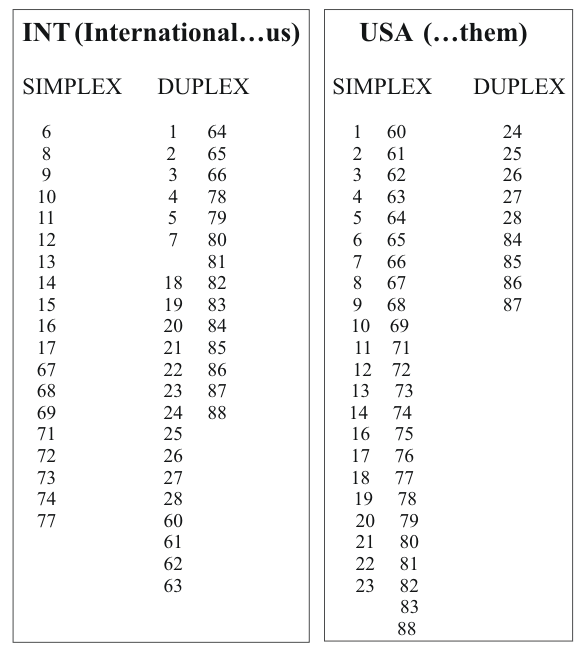 Below is a useful table from http://www.thecoastalpassage.com/vhf.html which lists the Simplex/Duplex allocation for the USA and everyone else.